The discovery of a heathland water body which hasn’t dried out is reason enough to spend a day or two at Ramsdown. 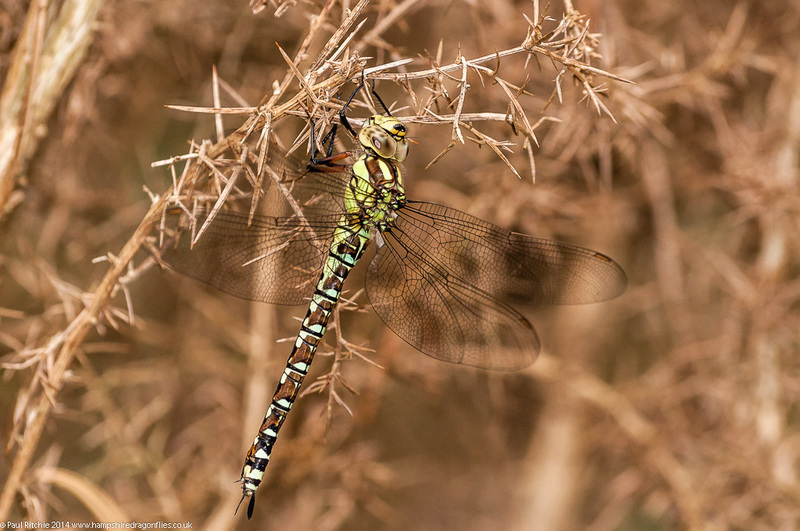 Of course the prospect of more Moorland Hawker sightings isn’t to be sniffed at. A solo visit on Friday with a reasonably early start. A little too early perhaps to rustle up any hawkers in the clearing, but an ideal opportunity to explore the larger pond under heavy skies. 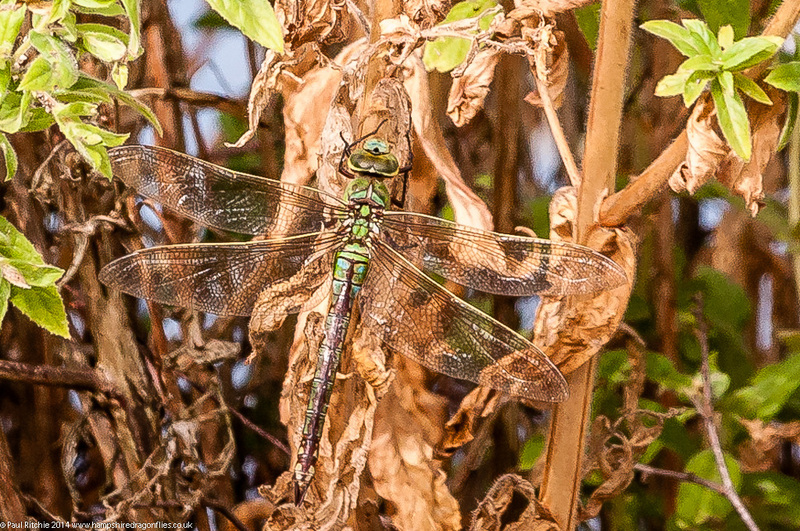 Sure enough, there were plenty of Emerald and Small Red, complimented by reasonable numbers of Black and Common Darters sheltering in the reeds under a presently gloomy sky. After doing a circuit I continued across the heath, finding the odd delight perched in the heather. Nice to see some heather which was pink, the majority having been attacked by their host beetles which had reduced most to a bare brown skeleton. 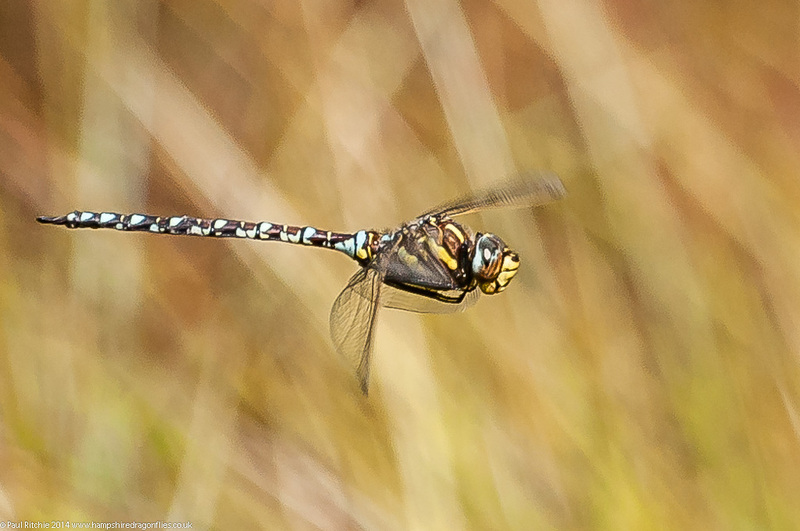 At 11.30am I arrived at the lower pond just in time to find a female Moorland Hawker ovipositing, but she rose at my arrival and disappeared for the time being. 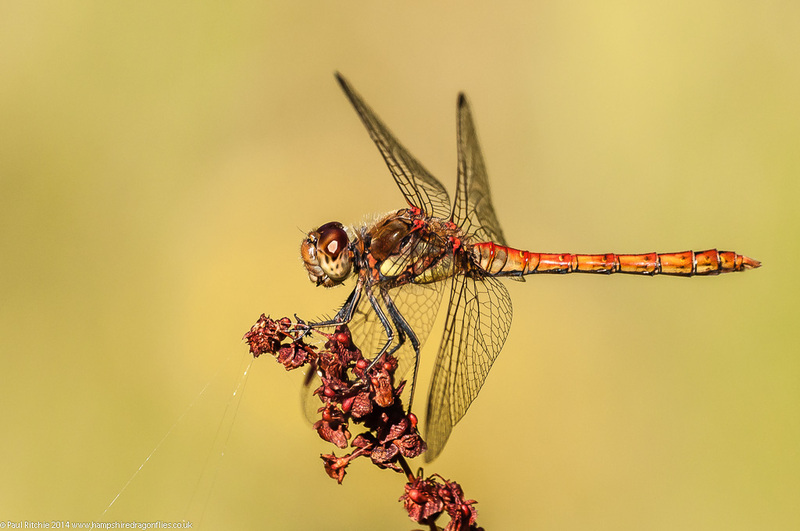 The broken cloud delayed the warming and it was another hour before things really began to kick off, with Black and Common Darters being the first on the scene. Visits by the male Moorland were a little infrequent today, and when he did arrive he didn’t stay around long. Mind you, neither did the sun, which more than likely accounted for the subdued activity. 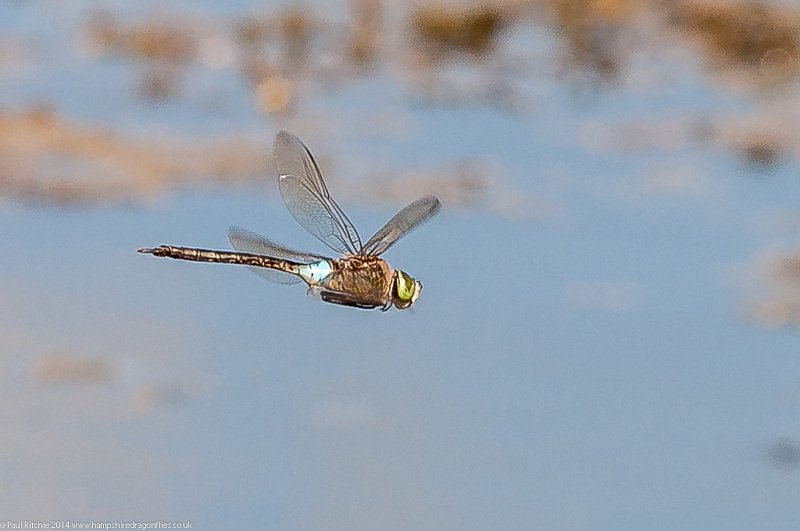 At least a Black Darter kept me amused. 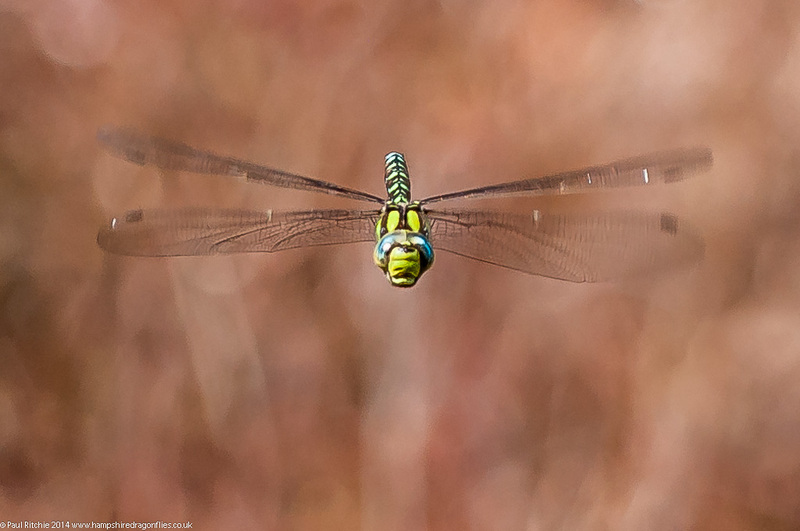 At 3.00pm a male Southern Hawker flew in and offered a couple of in-flight opportunities. The sheltered aspect of this pond unfortunately means it is mostly in shadow by mid-afternoon, so I decided to have a look at the clearing on the way out, and was a little surprised and certainly delighted to encounter this male Golden-ringed. 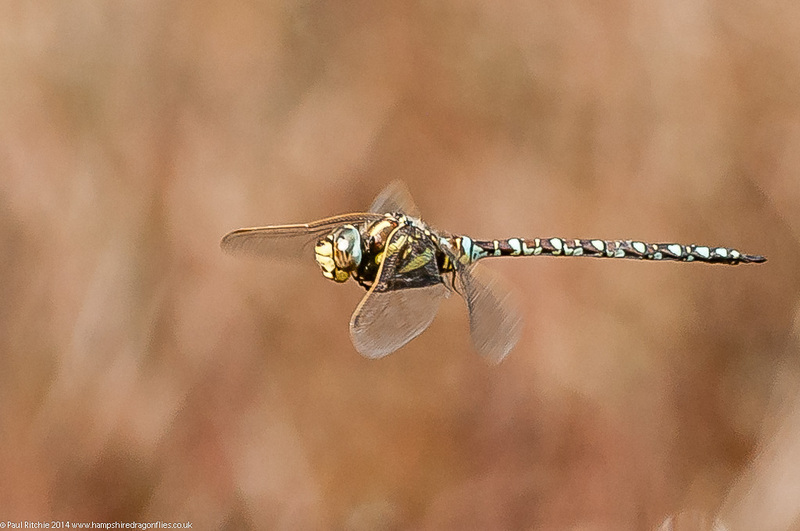 While the swarming hordes were polluting the rest of the New Forest, Doug and I decided to spend the day at Ramsdown in the hope of some good hawker activity in what turned out to be much better conditions. 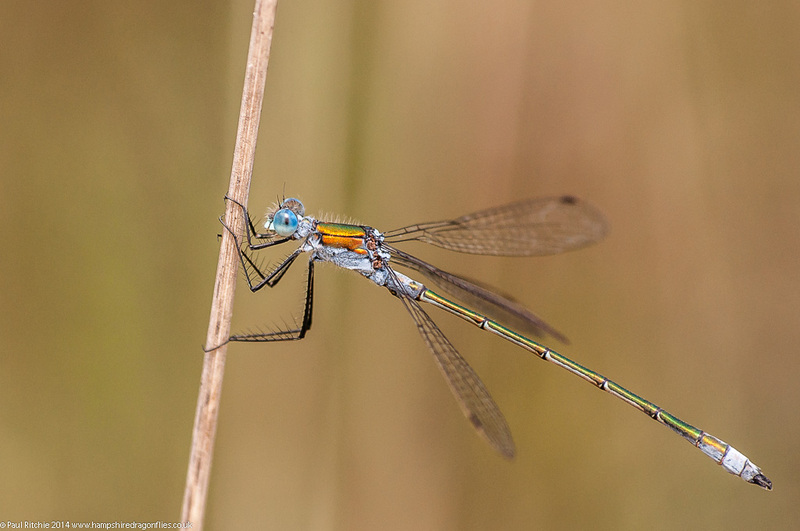 At least a female Emerald offered an early opportunity. And so onto Ramsdown, checking the clearing first before moving onto the sanctuary of the lower pond.where we found a male Moorland already patrolling. 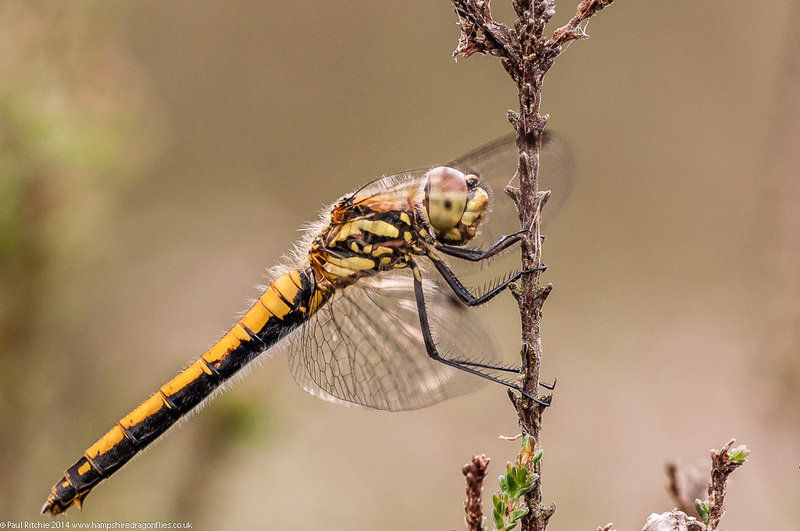 During a lull in the sunlight, we crossed to the other pond to witness another Moorland, a male Emperor and the usual strong populations of Black and Common Darter, Emerald, Common Blue and Small Red damsels. As it was lunchtime – a ritual seemingly shared by humans and dragonflies alike – we returned to the clearing to witness a fine display of hawking, with several Migrant, a brief showing of a Brown and at least one Moorland feasting along the tree line. One of the male Migrant landed beautifully in a tree close to us, and remained there in a state of suspended animation for a good half-hour. When lunchtime was over and all the hawkers had wandered elsewhere, we returned to the pond to find the male Moorland still in attendance. The male Southern also made a visit, as did the female, and an Emperor flew through but didn’t stay around. Once again, by the time 3.00pm had arrived all activity seized with the shadowing of the pool, so we returned to the clearing to catch the hawkers feeding. Interestingly the majority of the Migrant this time around appeared to be female, and there were plenty to keep us occupied. During the fine overhead display one-by-one they would drop down low into the heather or find a convenient low tree branch. 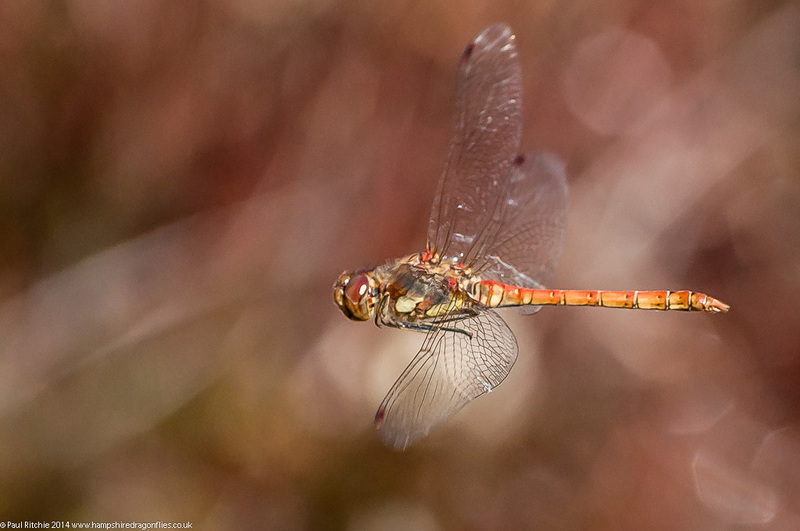 By 4.00pm even the clearing became quiet, so just enough time to grab a female Common Darter on the way out. 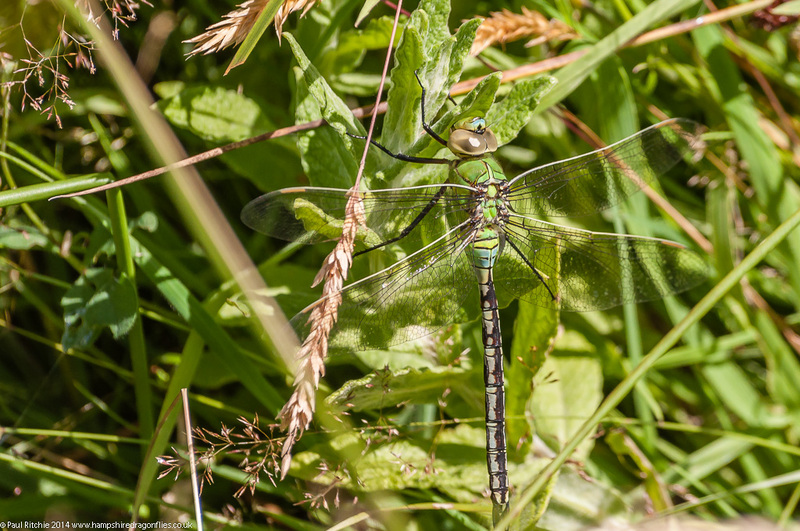 A thoroughly enjoyable day spent in the company of Chris Dresh, the Ranger for both Christchurch Common and Ramsdown, exploring and discussing the habitat and what improvements (if any) are necessary for species diversification with the emphasis on odonata. Just prior to our meeting I called in at the clearing in Ramsdown to see if I could rustle up any early risers. 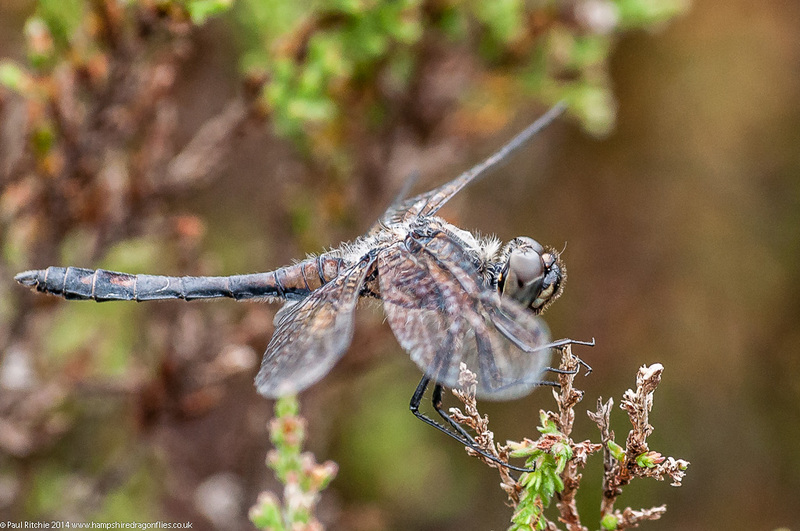 A couple of Black Darters were present in the heather and sheltering in the gorse were a male Emperor – the first I’ve seen for a couple of weeks – and a male Migrant. After meeting Chris we scoured the first path for signs of further roosters, but none were showing today. 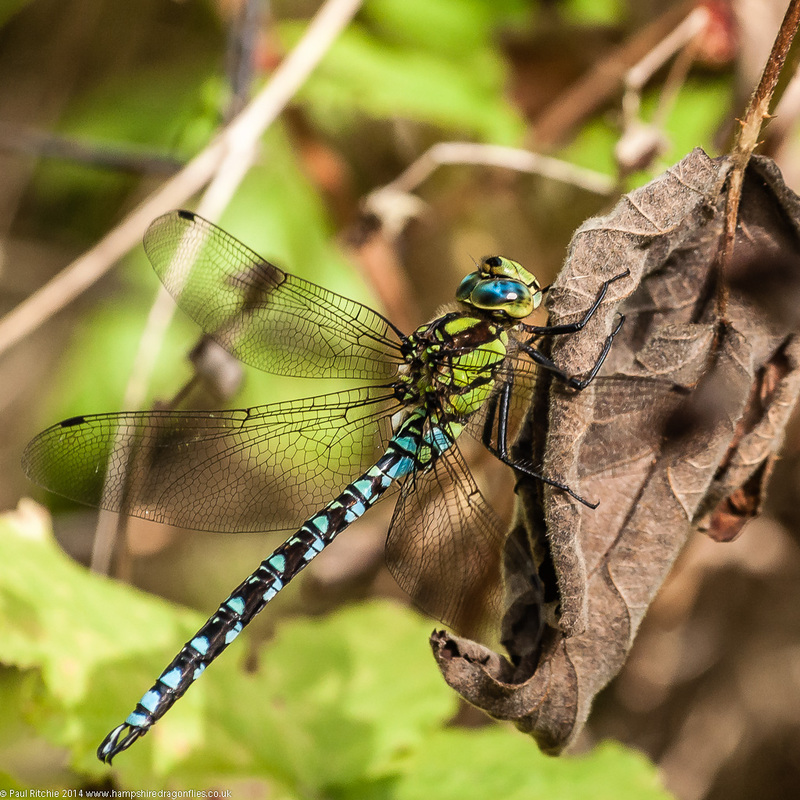 A full traverse of the reserve was carried out with several more Black Darters, some Common Darters and a few Emerald Damselflies present. 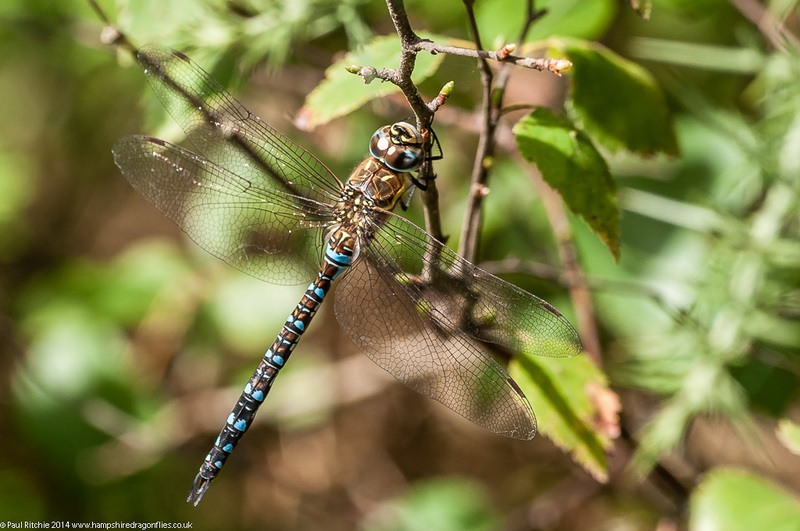 We didn’t really get our first glimpse of any hawkers until we walked the length of the old railway track, where we found a couple of Migrant, along with a male and a female Southern. Next we called into Ramsdown where Chris pointed out a newly-dug pond on the heath which, as with all the other heathland ponds, was currently dry – but will show real promise next season. Afterwards we spent a little time in the clearing watching a few hawkers feeding along the tree line, a male Migrant, a male Moorland and a Brown. 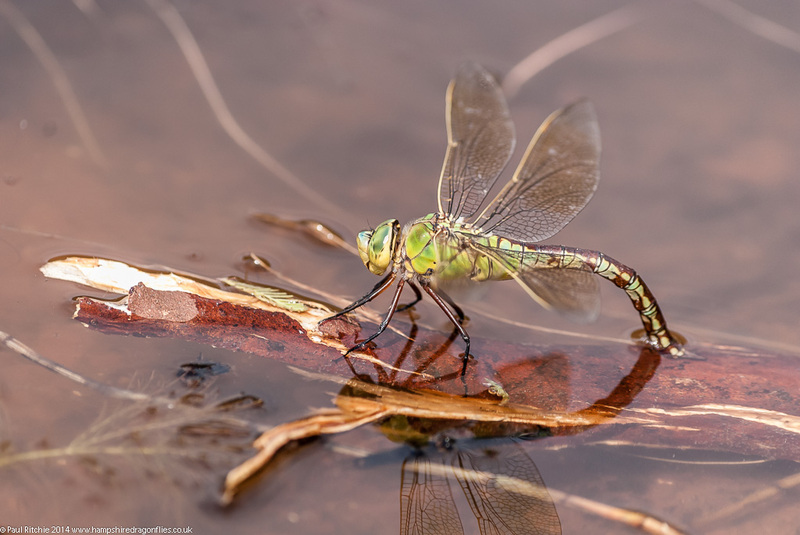 Moving uphill to the sunken pond which thankfully still contained a good amount of water with several Black and Common Darters, some Keeled Skimmers, and plenty of Emerald and Small Red damselflies. A real delight was the presence of a Kingfisher – the first of two sightings that afternoon. Chris informed me that this pond was created some years back especially for dragonflies from an old brick quarry , and has certainly proved to be one of the best ponds in the area with both male and female Moorland Hawkers present last season. A little work is needed to improve access from the encroaching Birch, but the sheltered position means this pond should continue to impress during the drier times. Next he introduced me to another pond close by created from an old brick pit, one I had previously failed to notice before. Again, this pond benefited from a good sheltered position with plenty of emergent and marginal vegetation – ideal for the Moorland Hawker. Once again a Kingfisher was present – possibly the same individual from earlier. 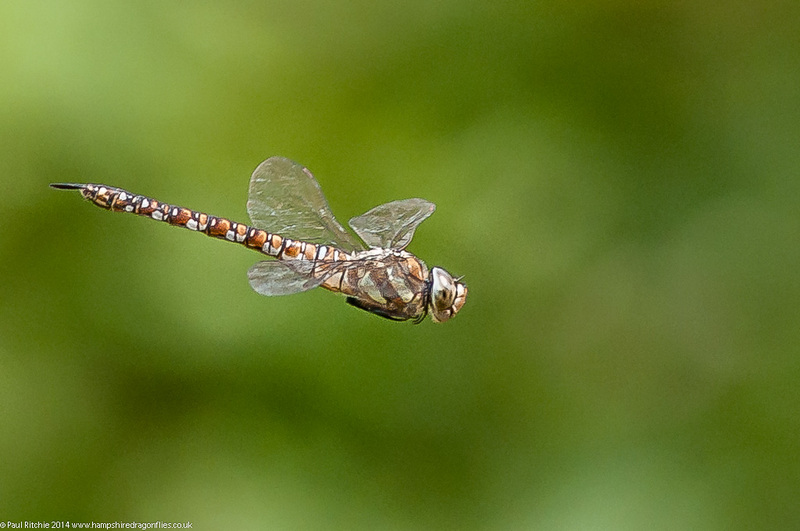 Thankfully a short moment later the sun broke through and we noticed a hawker patrolling the far bank. We waited until he made his way across to our side where we could confirm it was indeed a male Moorland. This was the moment we had been waiting for and our subject continued to patrol in and out of the reeds and provide excellent views and in-flight opportunities. Not since Priddy have I had as much fun indulging in my favourite pastime, standing at the side of a pond enjoying the spectacle and photographing a willing subject. Another highlight to an interesting and very informative day. Thank you to Chris for providing good company and the chance to gain new insights into one of my favourite sites. I could have stayed for a while longer, but had promised to meet up with Robin Proctor at Blashford if I had time. We only had a short time in the clearing, but did at least get a glimpse of a couple of hawkers, including a distant Brown. 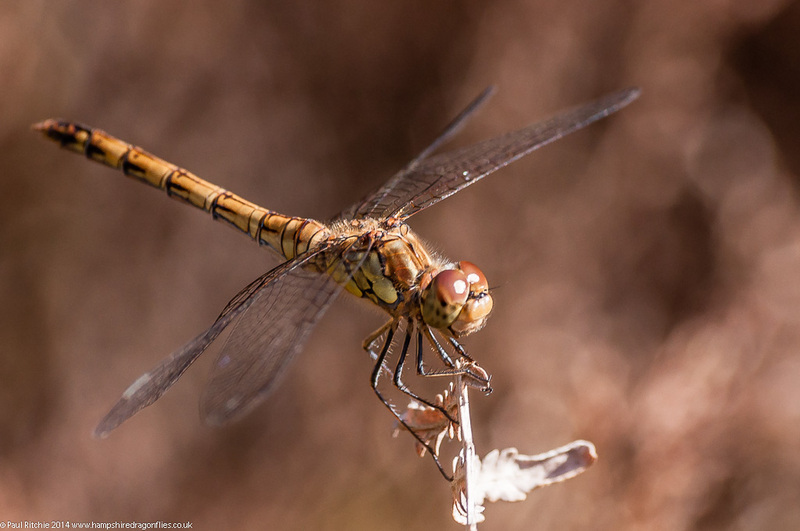 Like many of the best sites, Thursley can be hit or miss, and on Friday it proved to be very disappointing indeed. To be fair the weather played a large part; none of the forecast sunny spells until one very brief, subdued moment just after lunchtime and finally a break in the clouds just as I was about to leave at 4.00pm. I’d arrived just after 9.00am with a heavy blanket of cloud covering the horizon, temperatures decidedly cool with a fair sprinkling of dew still decorating the heath. Naturally the Moat wasn’t going to produce anything, and careful searching through the reeds and heather failed to produce even a damsel. I decided to take a walk around around the furthest reaches until it warmed a little, discovering a rather promising path I’ve completely failed to notice despite five familiar years of visits. A delightfully sheltered path bordered by find stands of gorse with a small clearing bordered by trees. Ideal hawker territory. 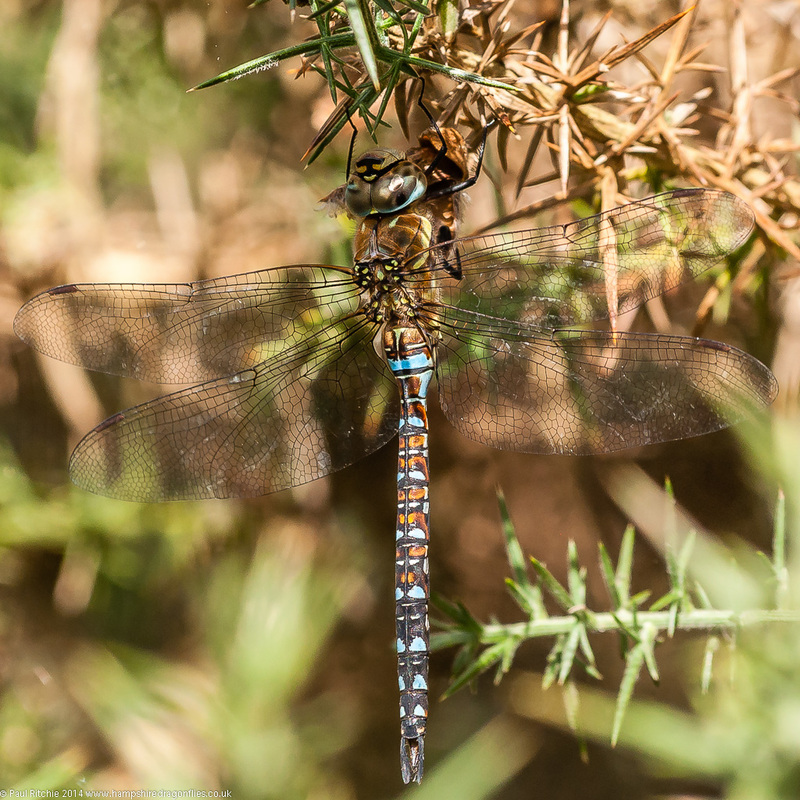 One of these gorse stands produced my first find of the day – a dew-speckled male Southern Hawker. Heartened by this early find I continued to search every gorse bush for further signs, but it was not to be. 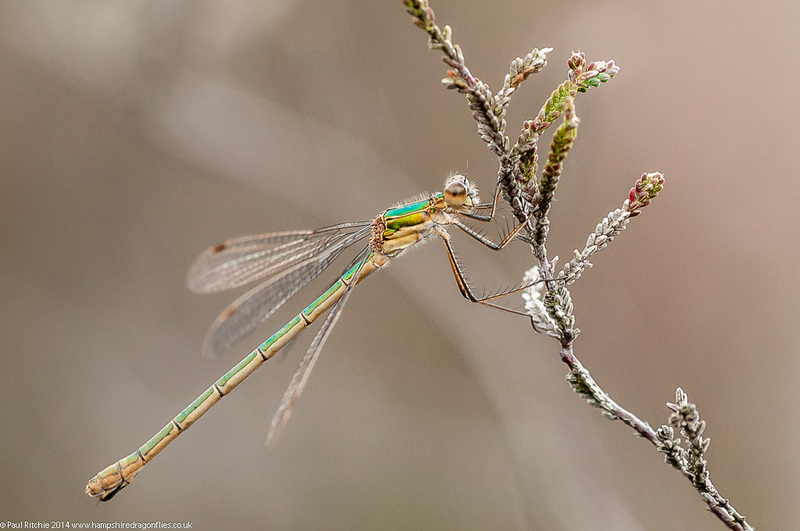 It was a good hour and a half until I reached the heather bordering one of the boggy pools, where at least the Emeralds were beginning to rise from their slumber. 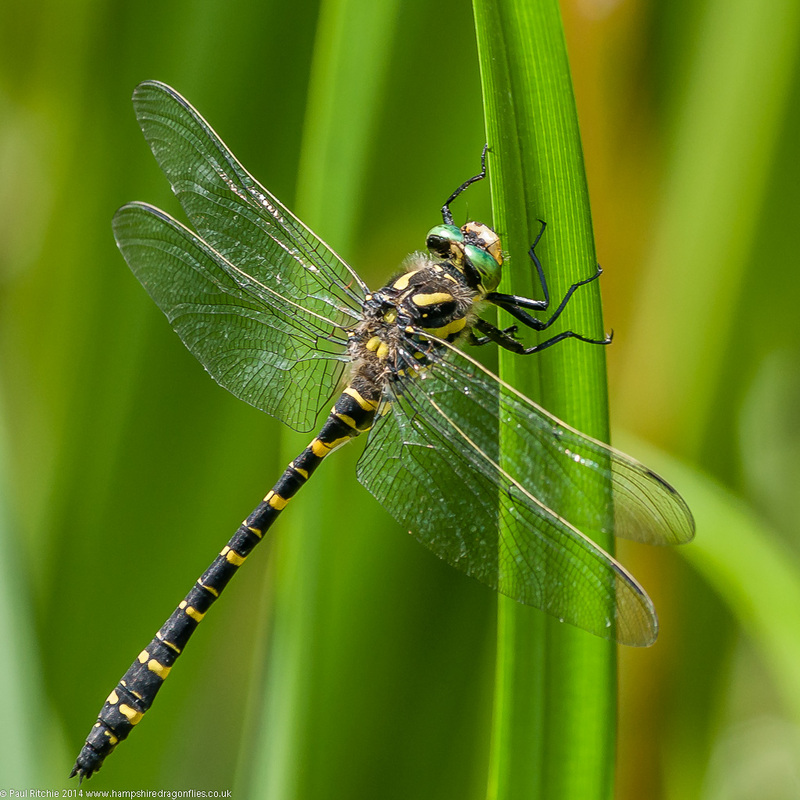 Another previously bountiful patch provided my first Black Darters of the day. 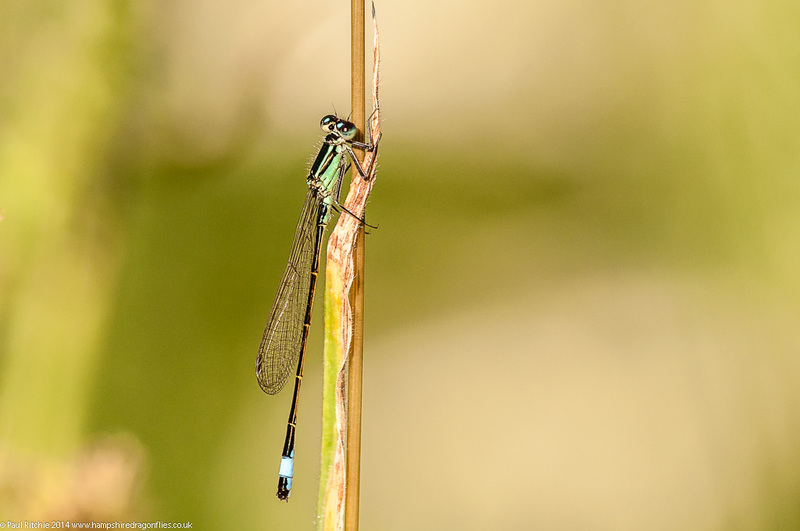 Having already covered the board walks and familiar patches, I returned to the Moat to check the boggy area where my count increased dramatically just after noon, with a good selection of damsels including Common Blue, Blue-tailed, more Emeralds and a couple of Small Red. 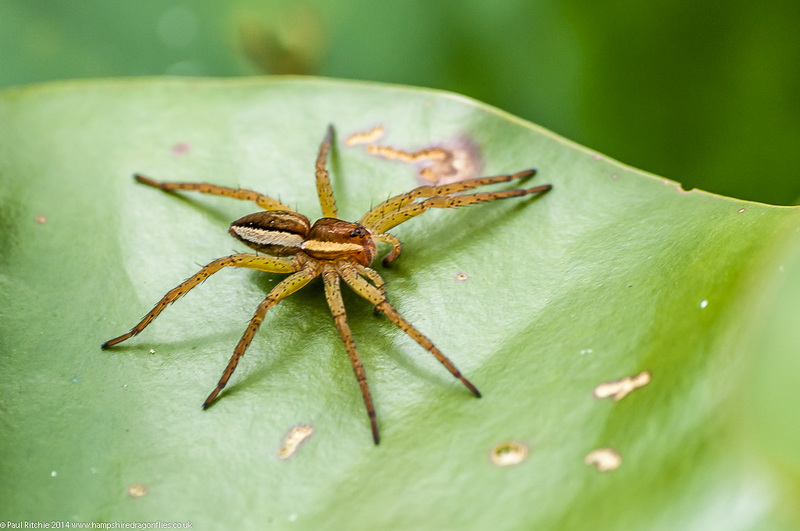 Unsurprisingly nothing was flying over the Moat, and even the Lily Pads were barren except for a lone Raft Spider. Shortly after that brief glimpse of sunshine the rains came, and I returned to the car to consider my options. 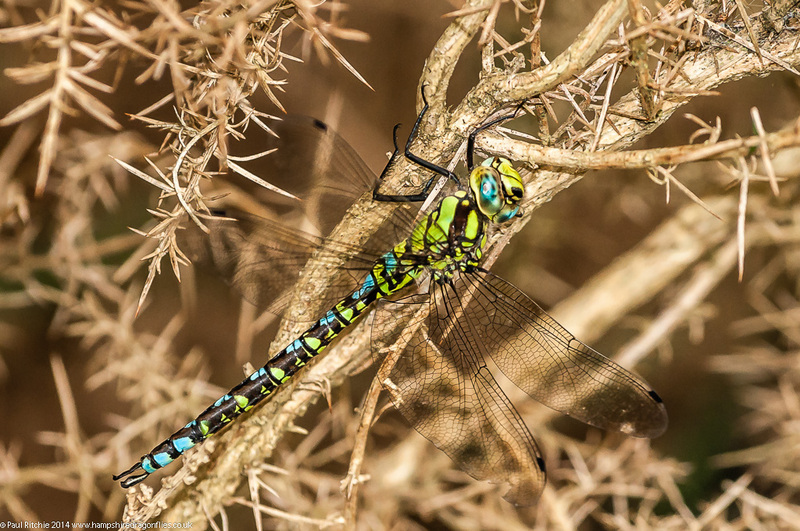 I’ll give it another chance rather than give up on the day, so when the shower stopped I did another full circuit of the board walks, carefully avoiding the plentiful baby Common Lizards, Black Darters and Keeled Skimmers who were taking what heat they could from the wooden planks. 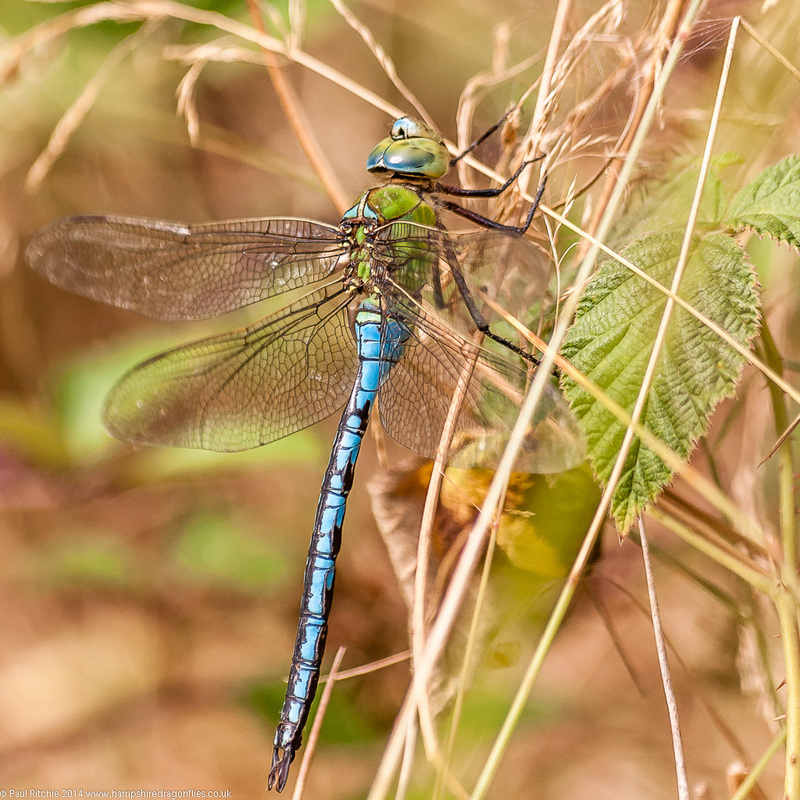 A few hardy Black and Common Darters, Common and Emerald Damselflies were braving the pools, some in tandem, but no sign of anything larger as the wide skies teased with distant blue skies. With an hour left I decided to give that little clearing another shot, and was surprised to find a male Southern still holed up in that little hollow. While standing back to grab an environmental shot I noticed he had a companion, perched inches away was a female. The use of fill-flash had disturbed her and she rose to circle me. For the next half-hour she put on a very fine show, hawking the bushes and coming in close in a manner usually experienced by curious males. This was the first time I’d witnessed a female act this way and it was a real highlight to end an otherwise disappointing day. With the onset of more familiar weather, and what appears to be a lull in proceedings with many favourite ponds dry, I’m having to consider my options. 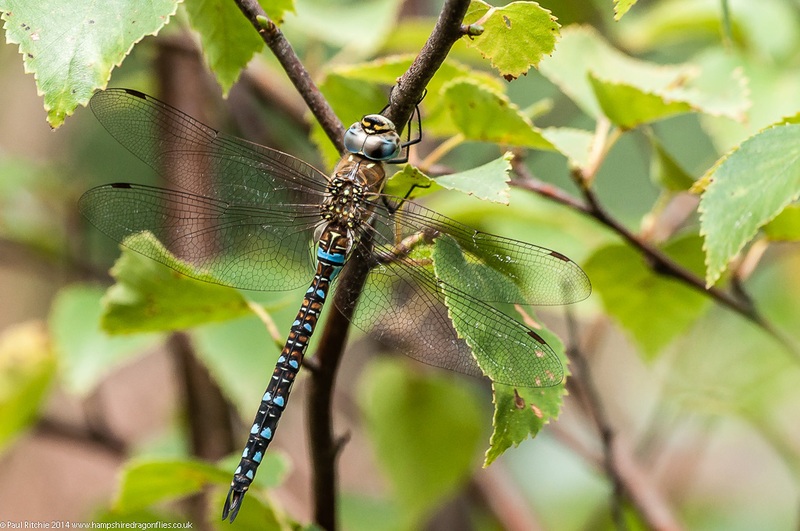 As August is prime hawker time I decided to set myself a little challenge on Tuesday – to attempt to get photographs of all four late summer hawkers on my own patch in one day. This was a big ask, but achievable – even if it meant some were in-flighters. In the case of the Brown and Moorland, this may have been my only option – provided of course I could find them all in one day. The Migrant and Southern should’ve been the easier of the four, although the latter proved surprisingly hard to pin down. I started at Christchurch Common, a favourite location of mine where potentially I could bag all four species. It didn’t take me long to find the Migrant, as I had two warming up on the gorse along one of the tracks. And then, totally unexpected, what I at first thought was another Migrant turned out to be a most welcome sight indeed. What an unbelievable start! 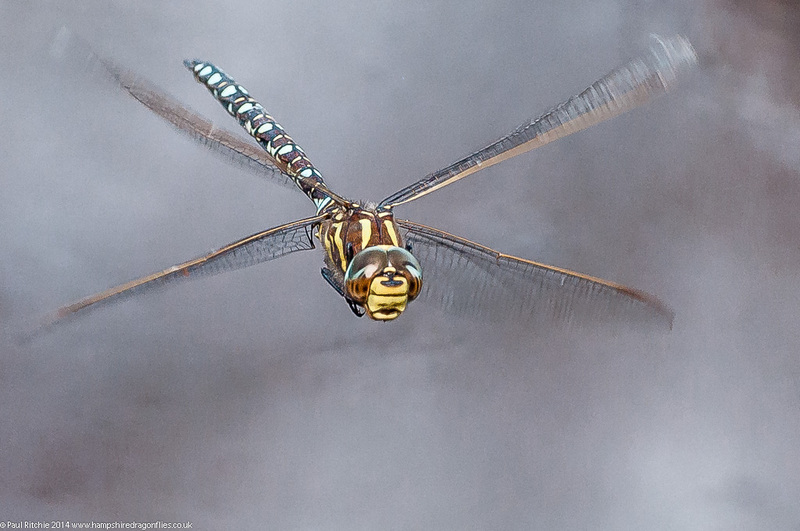 Here, teasing me while warming up his wings for a first flight, was the Moorland Hawker. Perched! The challenge was on. This stroke of good fortune spurred me on, along the full length of the old railway track where I hoped I’d at least find a Southern, but it wasn’t to be. Neither did I see any more Migrants, but I did spot a Brown disappearing at my approach. As per usual this was going to be the real bugbear I would face, having spent the past few weeks unsuccessfully trying to pin one down at Blashford, where at least there are good numbers. 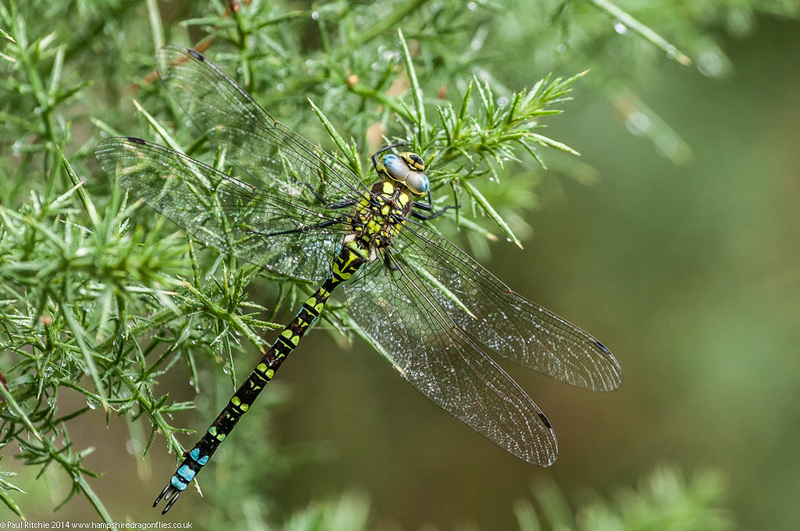 However for the time being I continued my walk around Christchurch Common, filling time with a few Black Darters and Emerald Damselflies, in lower numbers than recently, but this could’ve been down to the unfavourable conditions. A stiff breeze and the odd shower curtailing most activity on the water. Of some interest was the constant hovering of a police helicopter overhead. Having seen the main Bournemouth road come to a standstill, I presumed there was a major accident, but an unexpected meeting with an out of place bobby across the road at Ramsdown confirmed the reason was a ‘psychotic cow’ on the carriageway! Still, an interesting interlude brought to a conclusion after three hours with the offending animal caught and returned to pasture. It certainly brightened up an unsuccessful foray around Ramsdown. Next stop Troublefield, where surely I’d find the Southern? Nope. Not even one patrolling the ditch at the far end. Only a lone Migrant hawking the meadow, and no sign of the expected swarms I’ve happily seen in previous years. On then to Blashford, beginning at the back track behind Ivy Lake where I’ve recently found a few Brown hawking. Just the one, and he didn’t stay around. By the time I reached the hut clearing it was 3.00pm, and I was fast running out of time. My energy levels were surprisingly still high, despite nearly five unproductive hours. Still hungry, I tiptoed along the bramble looking for a tell-tale spot of blue, and there in front of me, bold as brass, was my target. I couldn’t believe my luck! He hadn’t seen me! 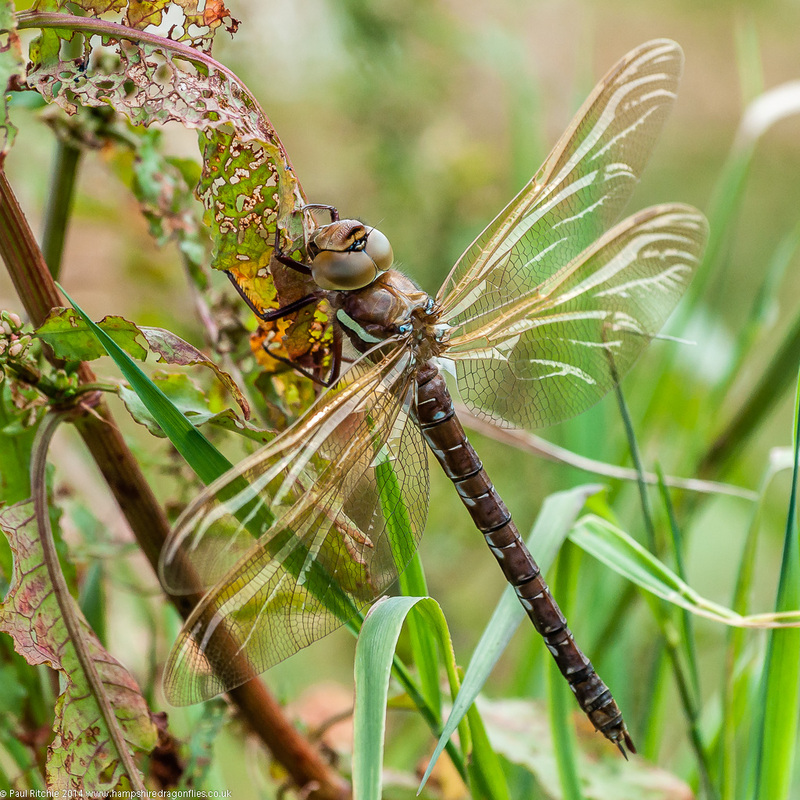 Had I found the first blind male Brown Hawker? Seems he was apparently day-dreaming, or whatever the insect equivalent is, as he continued to stay put long enough to rattle off a couple of shots and only noticed me when I attempted to change position. 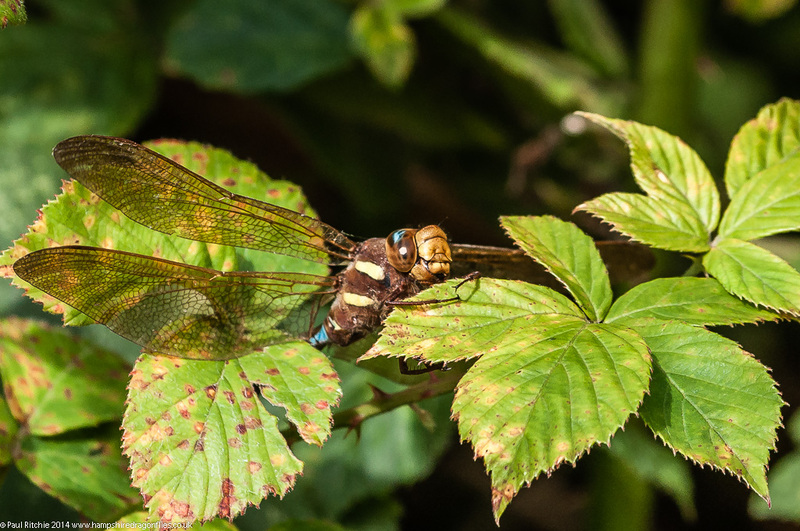 Instead of immediately flying off into the heavens, he ‘flipped over’ and landed behind a lower leaf staring straight at me, obviously surprised (and maybe a little embarrassed) he hadn’t spotted me earlier. Once he caught his breath and composed himself as best he could in this position, he freed himself and disappeared well out of sight as per normal. Three down and one to go, and with an extra spring in my step I continued on, doing the full circuit in search of the surprisingly elusive Southern. After circling Ellingham Pound and returning up the middle track, I almost admitted defeat. I still had enough time to try across the road, searching in vain along the track towards the first hide before back-tracking and doing the full circuit around the furthest reaches. 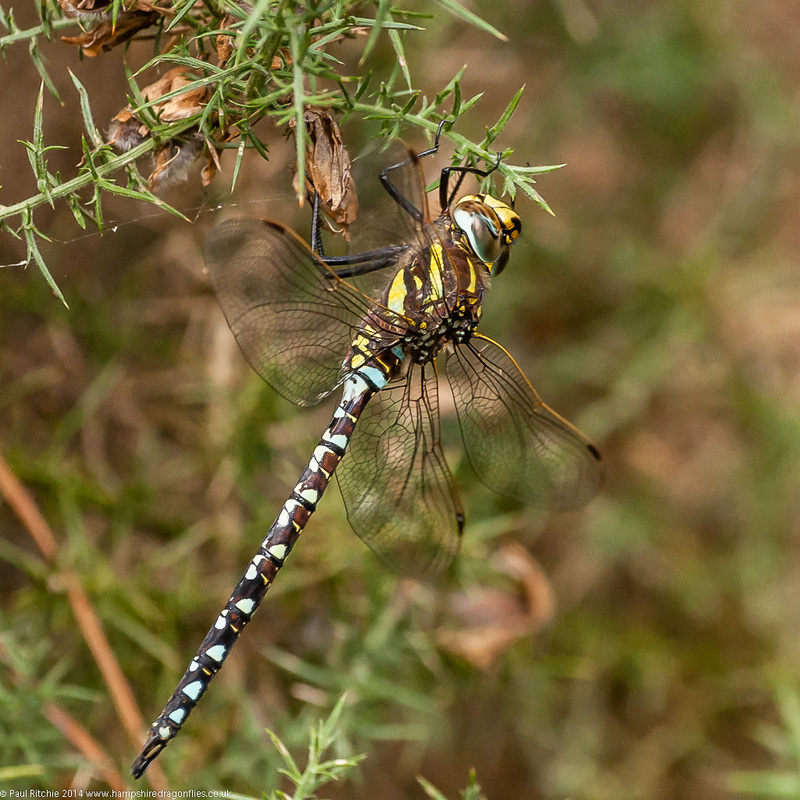 As I headed back to the car, defeated but still elated at getting three out of four, I caught sight of a hawker a few metres before the gate. I knew the Southern wouldn’t let me down. I think I actually punched the air and screamed ‘yes’ at achieving what I set out to do, however challenging and potentially fraught with failure. 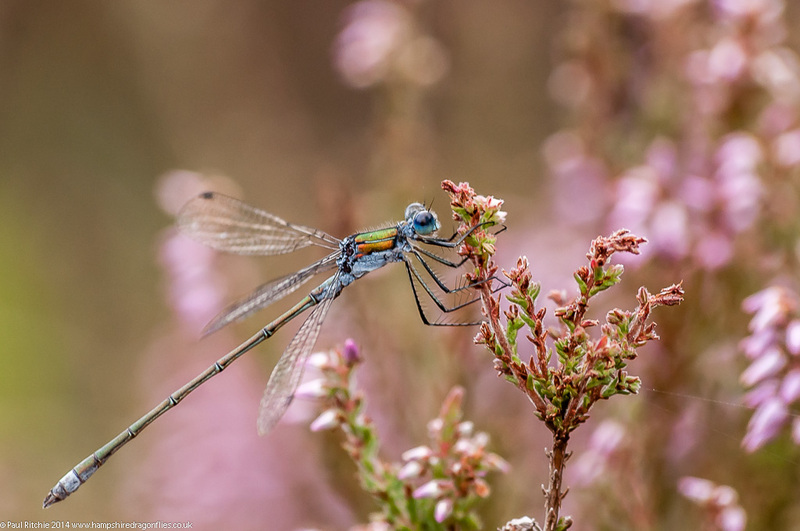 There’s no doubt it’s been a fantastic Spring and Summer; and those new to the delights of dragonflies have had a sensational opportunity to enjoy their splendour at their best. This season I’ve mainly kept the entries thematic; concentrating on one location or species. As I stare out of my window into the back end of Hurricane Bertha it’s probably the ideal time to catch up on a few unreported days. 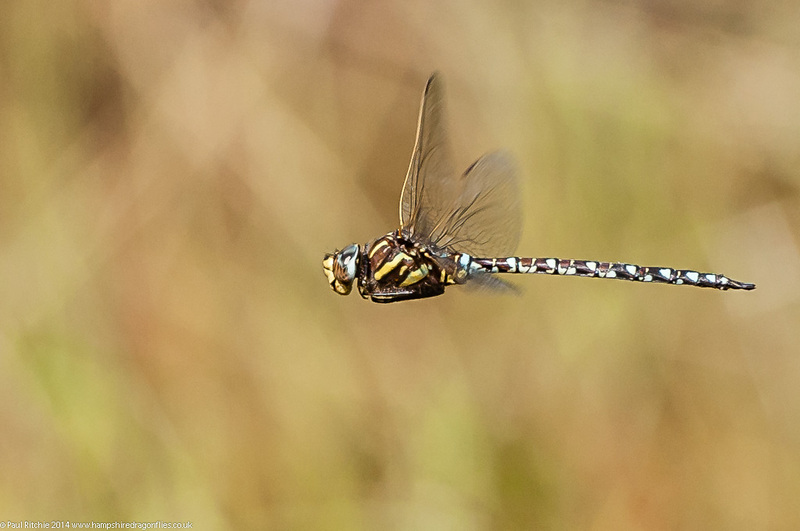 Emperors have certainly had a fantastic season with high populations seen almost everywhere. 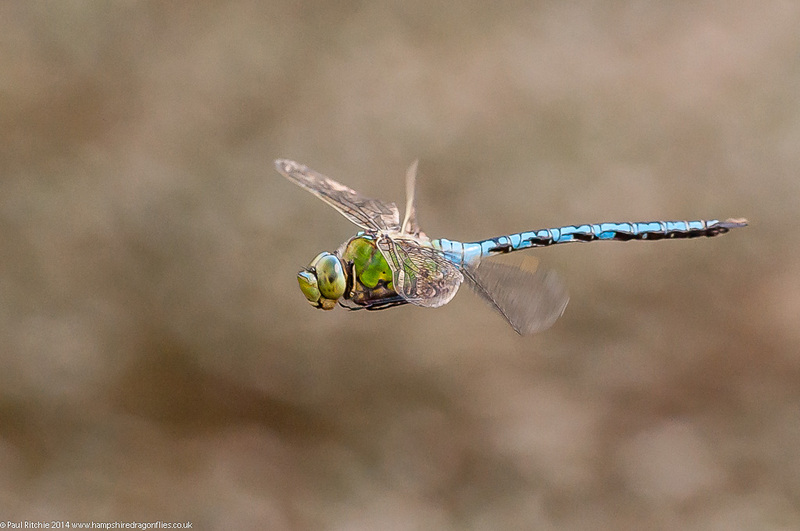 They remain one of my favourite species to capture in-flight. 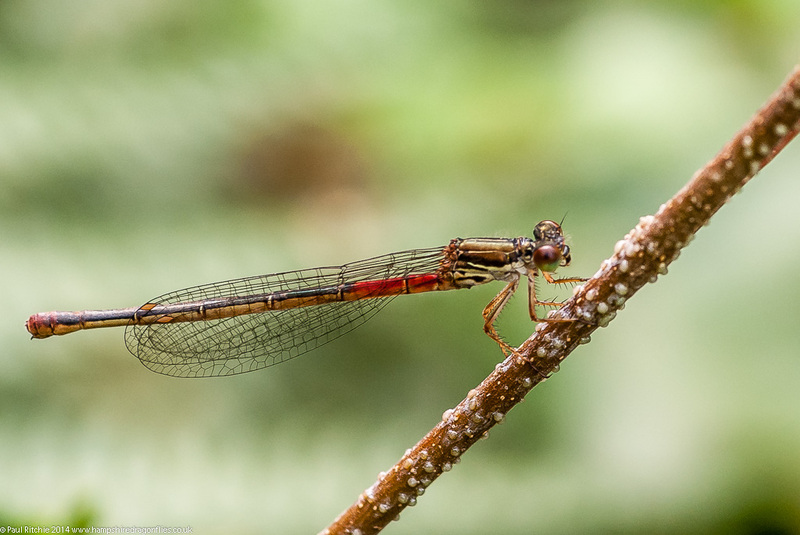 Other success stories this season have been Ruddy Darter and Emerald Damselflies, both seemingly expanding their range. 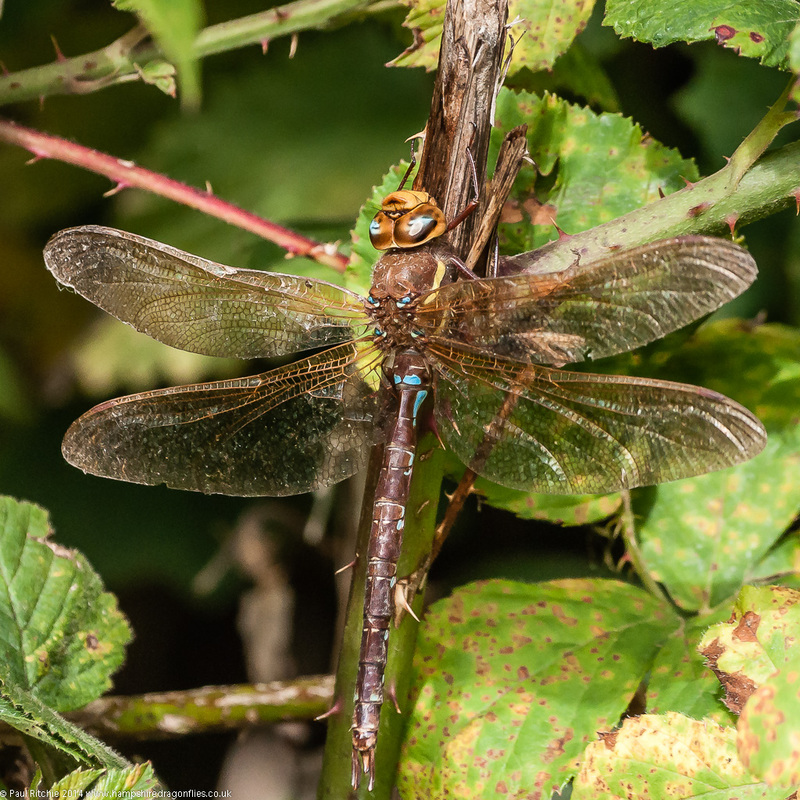 The Friday before our trip to Somerset, Doug and I investigated an area on the Avon flood plain near Christchurch which proved to be fabulous site for Brown Hawkers. 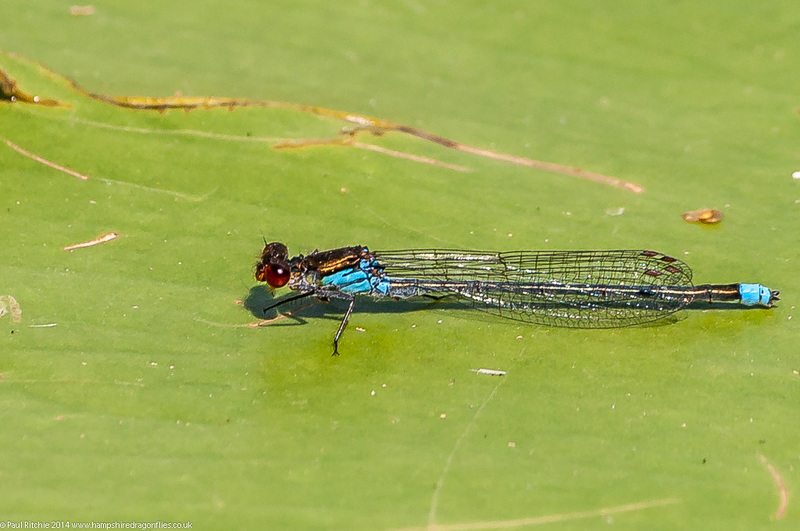 Didn’t make them any easier to pin down, although I did manage a perched female before my D90 failed. 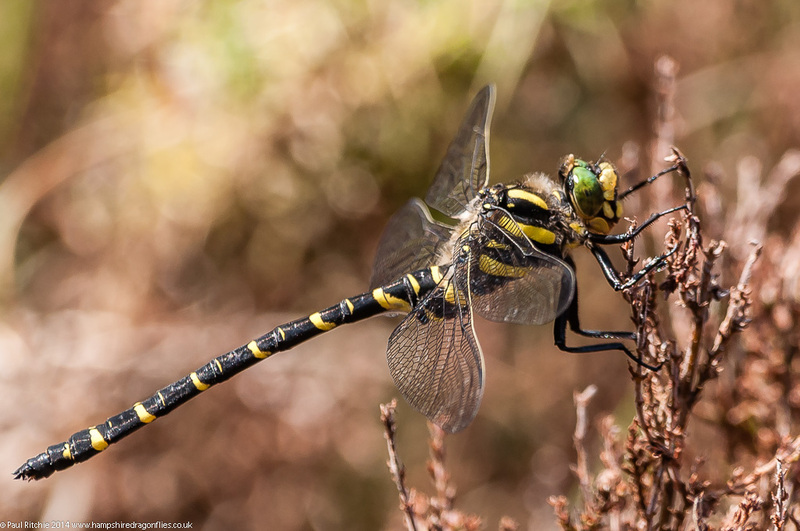 The following day at Priddy was dominated by the Moorland Hawkers, but this female Emperor provided an excellent opportunity for close observation as she deposited her eggs at the edge of the pool. I’ve regretfully failed to take full advantage of Ober Water this summer, but at least had a small chance to witness the delights when a friend from the north paid a visit a couple of weeks back. This past week has been a tad disappointing. 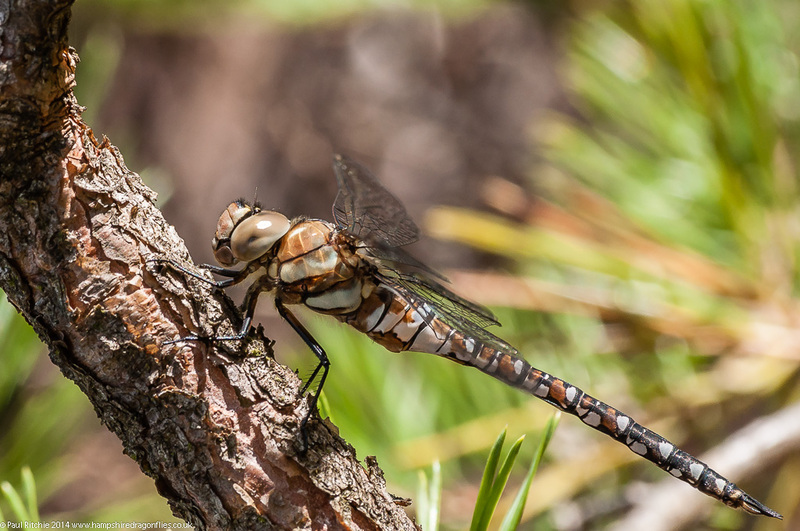 It’s as if the long, hot dry spell has produced a burn-out, with populations diminished, ponds dry and even the swarms of unapproachable Brown Hawkers looking the worst for wear. Besides the Avon flood plain, Blashford Lakes have produced the finest displays of the latter, but pinning one down has been difficult. 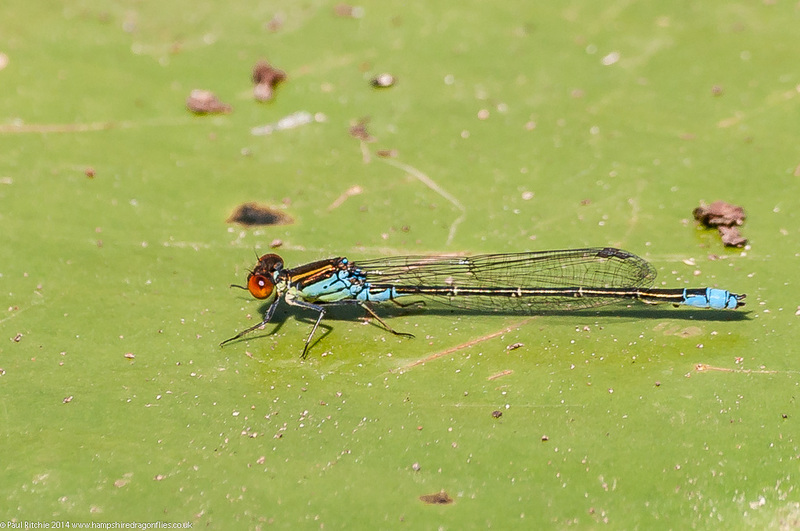 The lakes are also home to a good population of Red-eyed Damselflies. While searching in vain for a repeat sighting of the elusive Lesser Emperor earlier in the week we came across this fabulously pristine male (Common) Emperor, proof that this show off should be around for a while yet. 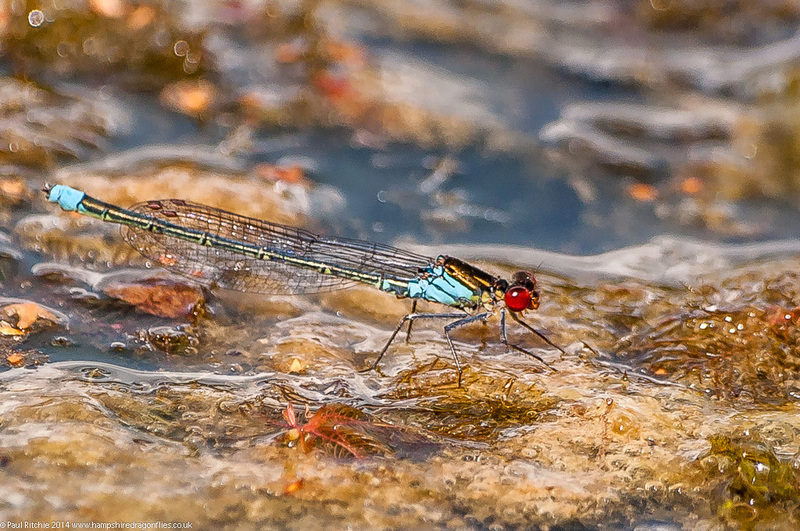 Still plenty of females ovipositing around the shore, this one conveniently offering a perched opportunity. A frustrating scout around Langham Lakes on Wednesday failed to produce much, but at least Troublefield provided a fine Golden-ringed opportunity. And so up to date with a stroll around Swanwick Nature Reserve yesterday afternoon. After giving this reserve such a good write up this year, I’m disappointed to report that someone in their misguided wisdom has prematurely razed the small clearing to the ground, severely compromising a fine feeding and roosting area which should have provided some prime late season odonata activity. If anyone from the reserve is reading this I would be grateful if you could e-mail me with a good reason why you thought it was a good idea to ruin this invertebrate haven so early in the season? 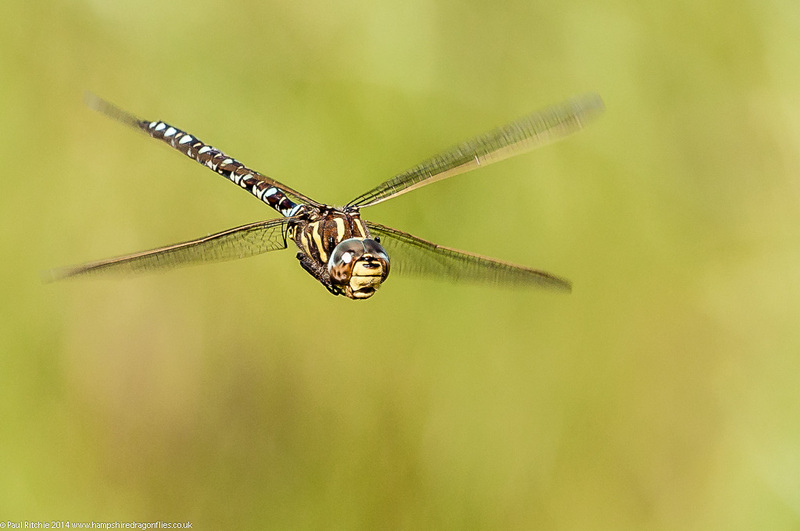 Robbed of what should’ve been some fine opportunities, we continued to the far meadow where we were entertained by a couple of female Migrant Hawkers ‘hawking’ around the trees; one at least landing briefly. Just enough time to grab a perched shot before she rose and joined her companion for a further round of relentless hawking. 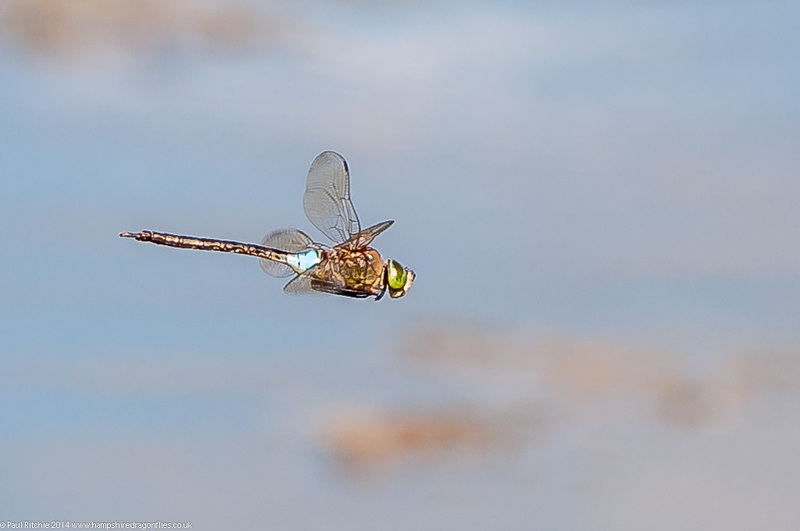 Hopefully some of the ponds benefit from this storm, with levels replenished enough to provide some fine hawker spectacles in the days to come. 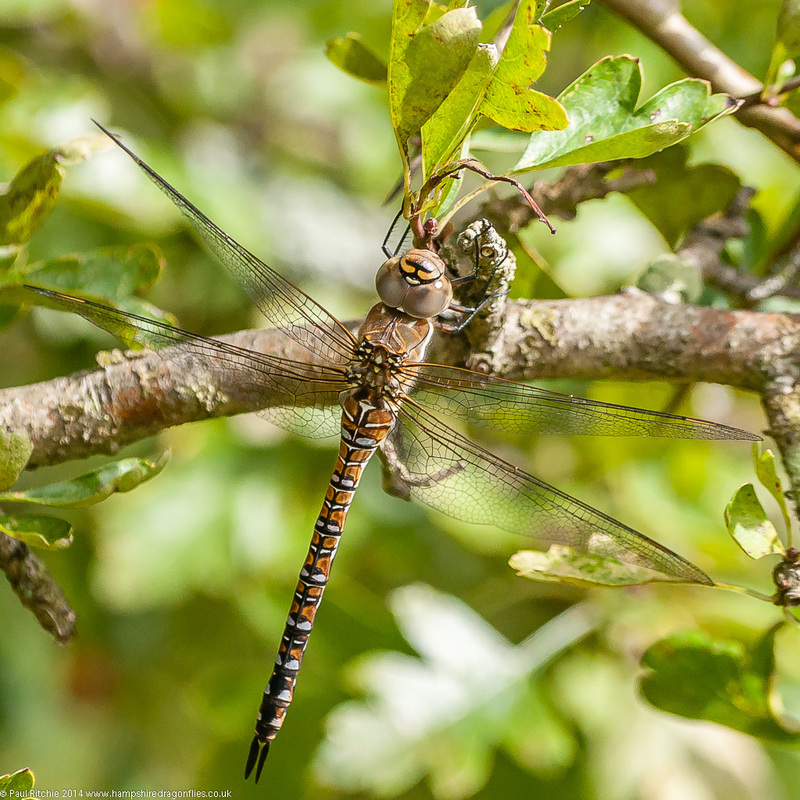 A bright and rather windy day with plenty of sunny spells meant choosing somewhere with plenty of shelter if we were to see anything, so Sue and I chose a few hours during the afternoon at Blashford – mainly in the hope of pinning down a Brown Hawker. 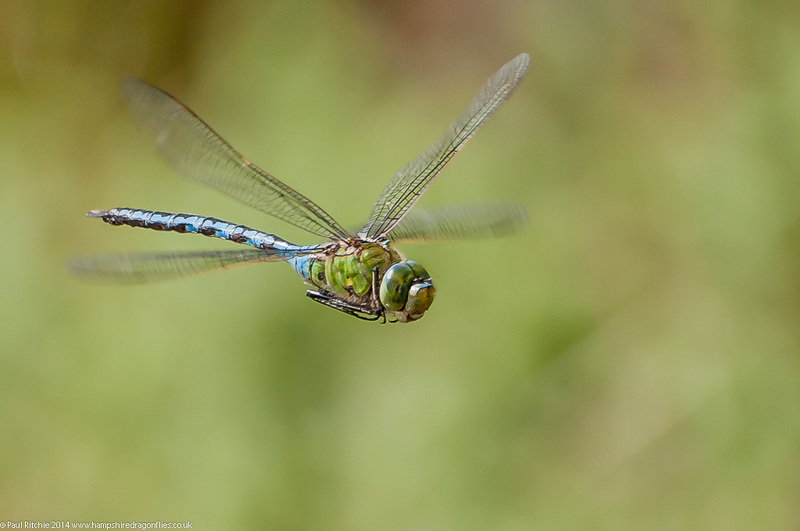 On arrival at the centre pond we were informed by the semi-resident toggers (hello John) that the pond had already had a Southern Hawker and indeed a Brown pop in for a short patrol. Now I can’t stay in one small spot hoping for a reappearance, so we headed off to those little pockets where we knew we’d find something. 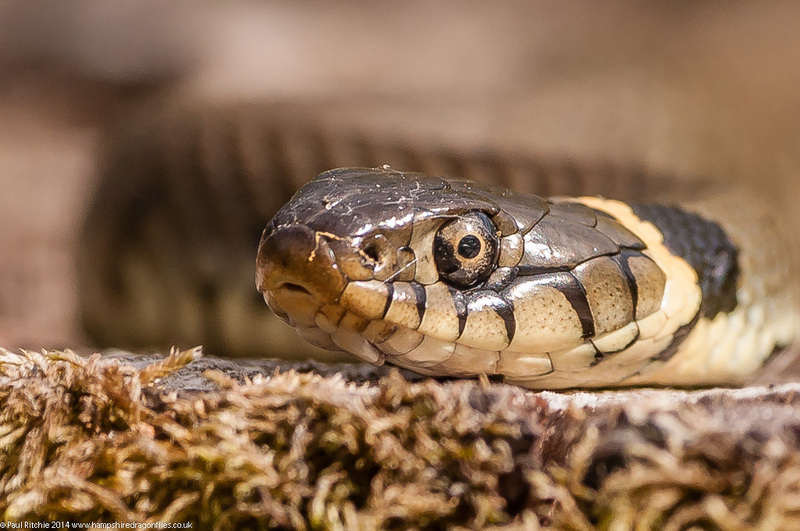 We called in at Ivy North hide where a close view of a basking Grass Snake offered our first opportunity of the day. Continuing on we scoured a small clearing where the Brown’s were usually seen hawking for food, but after a good wait under changeable conditions they didn’t show. 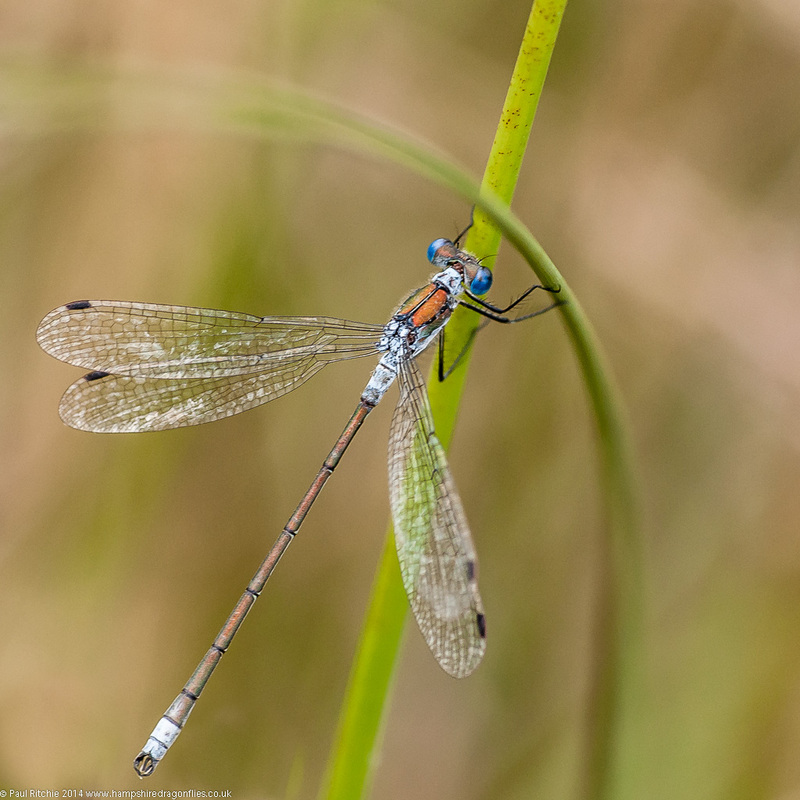 Onwards to the south clearing where we had our first glimpse of the Browns, along with a Migrant, a Southern, a couple more Emperor – including a female – and countless Common Blue damsels. We spent a good hour watching them hawk during the sunny moments, completely failing to pin one down – not helped by the extensive scrub which prevented any close stalking. We continued north along the back track, surprisingly failing to see anything large, towards Ellingham Pound lake. As we walked through the gate I mentioned to Sue that one of these days I’ll find a Lesser Emperor here. 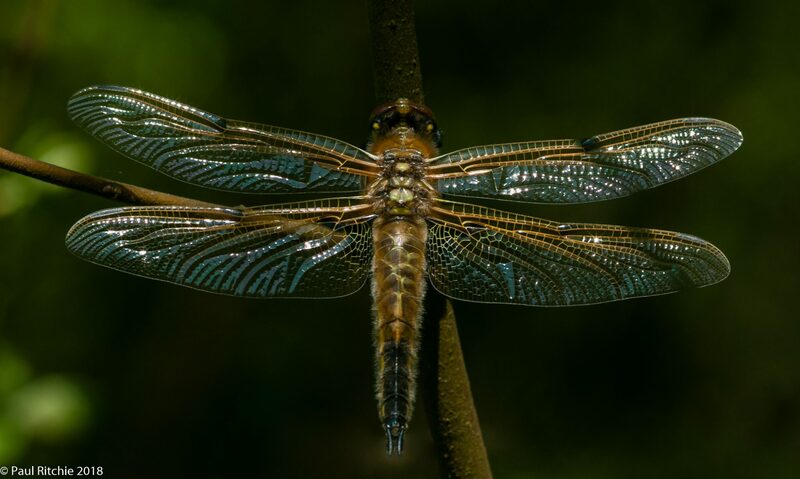 As soon as we reached the shoreline we caught sight of something large flying towards us in an unfamiliar pattern, and there indeed was my first real (and close) sighting of this rare visitor. 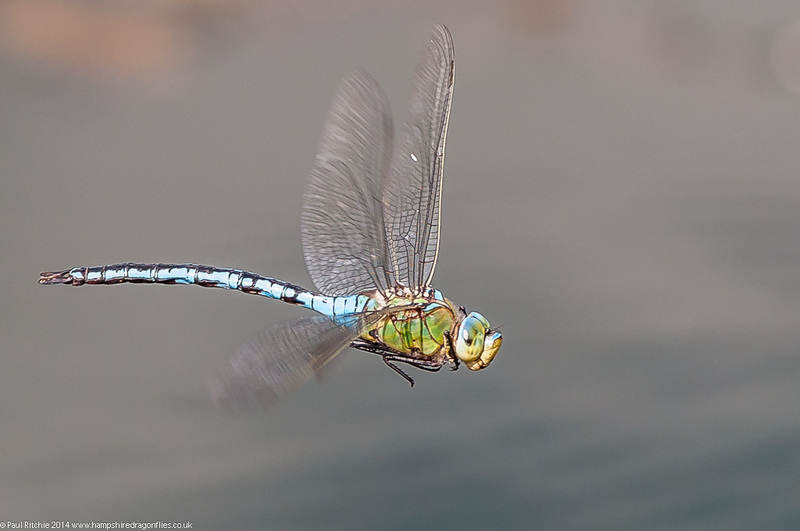 The unmistakeable blue band and dark abdomen disappearing off towards the further shore. That did it – we weren’t going anywhere! The usual panic set in as I hoped we’d get another glimpse; and of course a photo opportunity. This overwhelming excitement had me racing towards the opposite corner, scouring the horizon before sensibly returning and practising in-flighters on a resident male (Common) Emperor in case he returned. Sure enough, over the course of the next hour we had another half-a-dozen sighting as he flew in, only to be chased away from his resident cousin. Thankfully he stayed a short while a little further along the shore, allowing me to grab a couple of distant in-flighters. This is another first for me, and it took a long while to come down from the experience. From now on I’m going to make a little wish on every outing. A couple of hours spent locally at Swanwick Nature Reserve is ideal when the changeable weather negates a full day out. The site has seemingly taken a long time to bring forth the goods, but when it does I always come away satisfied and often nicely surprised. 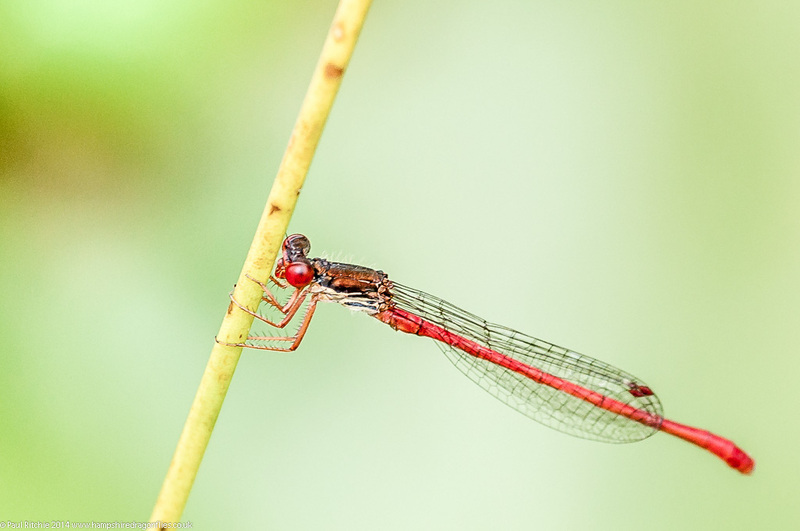 There is a small dipping pond next to the Centre Lake which usually throws up a few surprises, whether it be closely-perched Migrant Hawkers late in the season, patrolling Southern Hawkers offering ideal opportunities for in-flighters, or an interesting selection of damsels, including Red-eyed and, as of this season, Small Red-eyed. Well-maintained meadows are also favourites for feeding Emperors, with several usually seen hawking low over the grasses or high along the tree-lined borders. Females are particularly fond of perching very close to the ground, no doubt trying to avoid the gaze of passing males. While doing a circuit of the fishing lakes I bumped into Alison Barker, here to do a dragonfly survey. 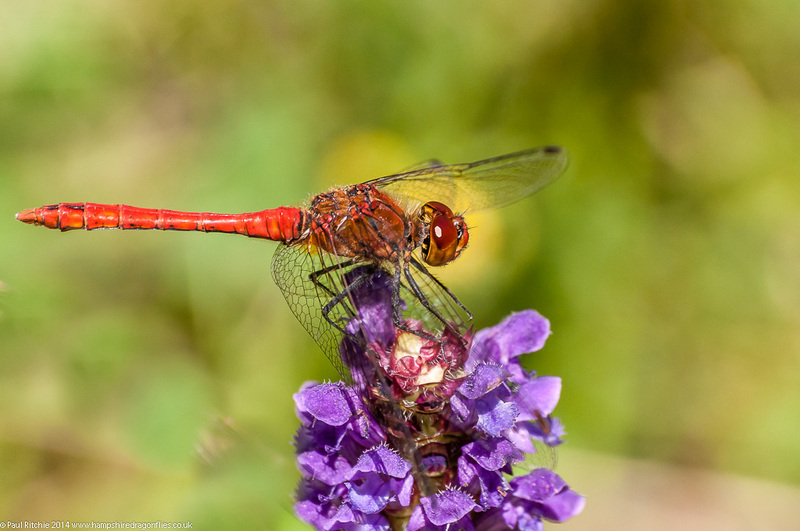 She kindly pointed out a pristine male Ruddy Darter, the first I’ve encountered here. Since then I’ve encountered a few more around the centre lake, a blessing knowing I can find this wonderful species so close to home. 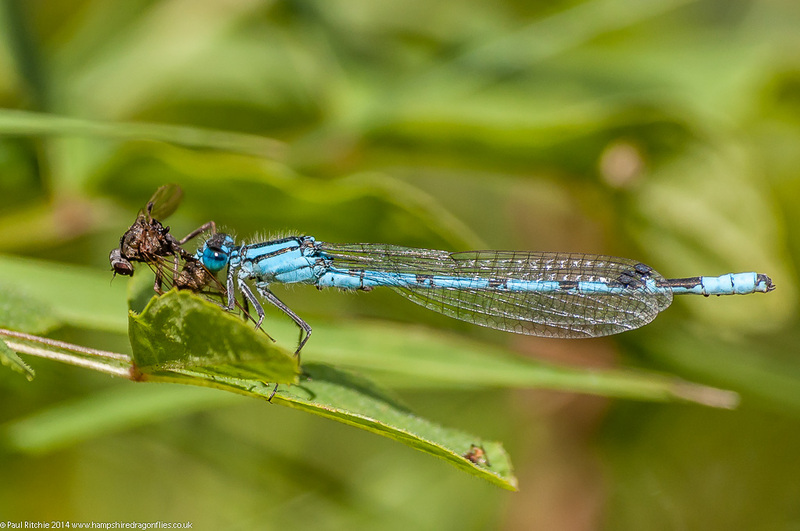 Tom’s Lake is used by the local fishing club, and is always worth investigation, not least for the strong populations of Red-eyed, Common Blue and Blue-tailed Damselflies – the latter of which usually found resting away from the water on a small patch of sun-dappled meadow. 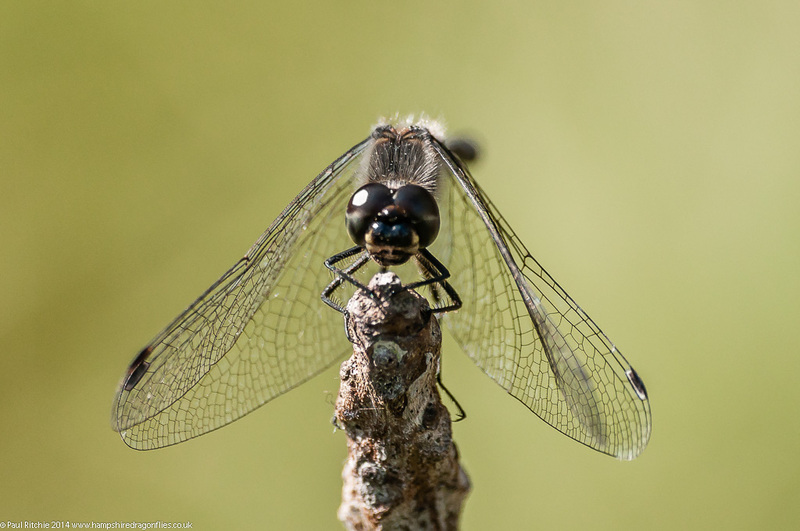 On my most recent visit I was pleased to find the Small Red-eyed were also present, along with good populations of Black-tailed Skimmers, Emperors and a few Four-spotted Chasers. Besides the increasingly fine array of dragonflies, the meadows are also home to strong populations of butterflies. The small woodland area deserves a mention for the presence of the rare and elusive Purple Emperor, which I was lucky to catch a glimpse of last Wednesday. I even had a Stoat cross the path in front of me. 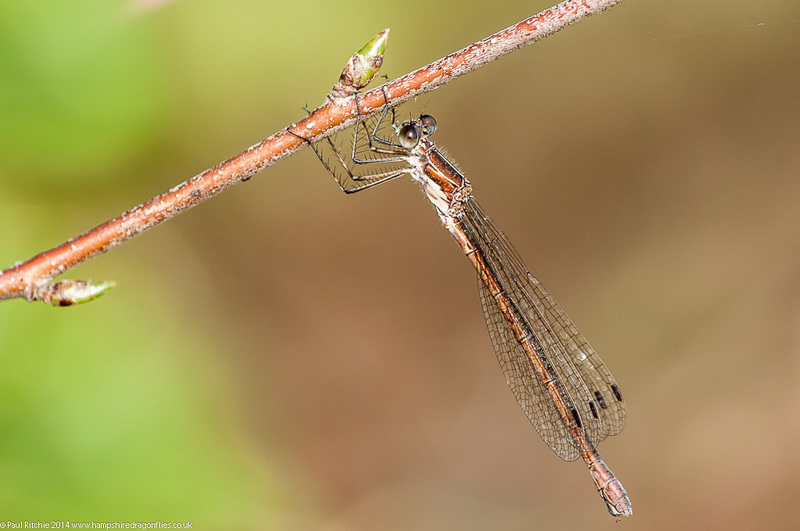 Many thanks to Alison for providing my first Swanwick Ruddy opportunity, and a great many thanks to the management and volunteers who are (seemingly) doing everything right, giving invertebrates the attention they deserve. Other wildlife trust reserves should take note.